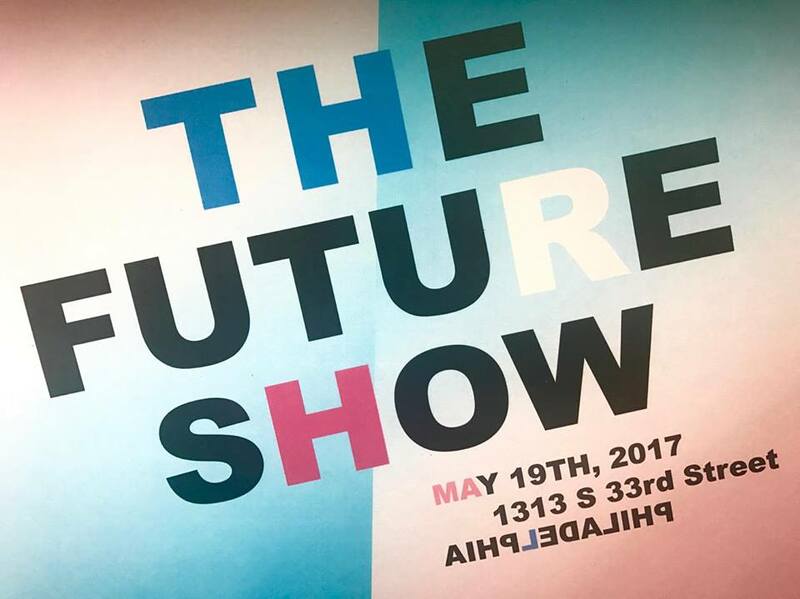 The Future Show took place on May 19th, in South Philadelphia. It was a group themed show, featuring the work of six artists. The development of the show happened in a highly collaborative way, in which the artists worked together to create a one night experience. It all started when I had my initial idea to curate an exhibition based on the future. The main challenge was to narrow down such a broad idea and get down to the core of it. “How do we move forward?” was the insistent question on my mind the whole time. “As an invitation to experience the future right now, “The Future Show” encourages the viewer to look into the future of our creative processes. The work put forth by these artists are diverse in both subject matter and medium, ranging from sculpture, installations, drawings, photographs and paintings. The art of the future poses questions that artists will explore collectively as well as integrating the viewer to the artwork itself. How can art move forward when all possibilities seem to be exhausted? Is it still possible to create brand new works of art? The Future Show takes the element of time into consideration as well as questioning the role of technology in the artist’s practice. STEPHANIE WRUCK is from São Paulo, Brazil. She graduated from Temple University and received her Bachelor’s degree in Communication Studies and Art History. She has always been interested in the relationships between media and art history, focusing on curatorial methodologies, creative writing and photography. As the curator of The Future Show, Stephanie is offering a singular experience as well as encouraging the viewer to deeply engage with the artworks presented by the artists. MATTY GUILIANO received his BFA from Pennsylvania college of art & design in 2014 and currently lives and works in North Philadelphia. His soft sculptures emulate colorful set display and design and are a homage to craft work that has less apparent value in the world of ne arts. MARINA PEDROSA is a born and raised Brazilian writer and photographer currently based in New York City. Concerned with meticulous detail in all that she does, Marina’s work is full of conceptual ideas and character. Experimenting with writing, digital photography and the co-relation between them since 2008, her photographs portray art as its own language, embodying visual symbols that cannot properly be translated into words. LUIZA CARDENUTO was born in São Paulo, Brazil. The uninhibited self-expression and passion of the American arts inspired her move to the United States and she now resides in Philadelphia. She earned her bachelor’s degree from the School of Visual Arts in New York City, in Visual and Critical Studies. Luiza hopes to strengthen the bond between art, economy and culture in her homeland of Brazil, as well as globally, uniting people by giving them the tools and opportunities to create. PATRICK DIAS is a Brazilian mixed media artist and lover of drawings. His most recent works are focused on illustration and telling stories through the images he creates. With a high appeal of character design and fantasy symbols, he brings the world of imagination living in his head to visual reality. JEREMY SIMS specializes in atypical craft, Contemporary Design & Surface Development. Sims has taught for several facilities including Baltimore Clayworks and The Wayne Art Center. In 2015 the solo show US AND THIS was showcased in Dallas with That Gallery and Plenum Space. Stationed in Philly, Jeremy makes personal art projects and custom orders in Hope Street Social Club, and regularly exhibits in the city. Jeremy Sims – Unentitled #3 , Ceramic, Enamel and Rubber. The conclusion? The future is handmade, bright and collaborative.